We’ve been experimenting with bread making today. After the success of Alex’s crumpets and English muffins using a batter rather than a dough we thought the method warranted further investigation…. Usually we use the Doves Farm gluten free flour mix for baking, but this time we wanted to play around with different flours, thickeners and emulsifiers and see what we could come up with! 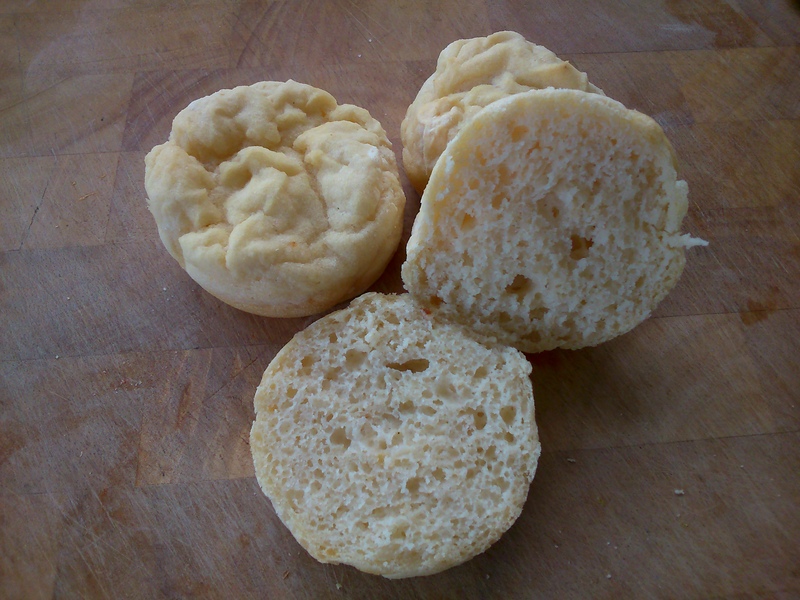 The resulting rolls have a great structure with little air bubbles throughout and a lovely moist crumb. The guar gum in combination with tapioca flour and xantham gum gives the bread a much softer texture than other recipes we’ve tried, and it doesn’t toughen as it cools which can be a problem with gluten free breads. We also tried them with and without lecithin. And although without lecithin does yield a good result, adding it far improves the rise gives a much more even crumb. Its better to prove the batter in the baking tins, as otherwise air is lost when transferring it. It’s really important to keep as much air as possible in the batter. They rise very prettily when they’re baking! We’ve sampled them various ways, with soup, and as notmeatball sandwiches, and also baked as tiny foccacia with olives. All utterly delicious! Well be posting the other recipes over the next few days. If you’re using lecithin we’d recommend smoothing the tops before you bake them, we didn’t with this batch and although the texture is great they kept pretty much the same shape as the batter. In a large bowl mix the dry together ingredients together thoroughly. Add the water and mix together using a balloon whisk. The batter will be similar in viscosity to a victoria sponge or pound cake mix. It will be slightly thinner if you don’t use the lecithin. Carefully spoon the batter into 10 of the muffin holes and cover the tray will clingfilm. Remove the cling film from the tray and bake for 20 minutes until risen and just starting to brown.